The tallest highrise in New York—1 World Trade Center—officially opened this week. It's been a long time in coming, to say the least. Of its 104 stories, 68 will house offices and 13 are devoted to mechanical systems. The basement alone is five floors. 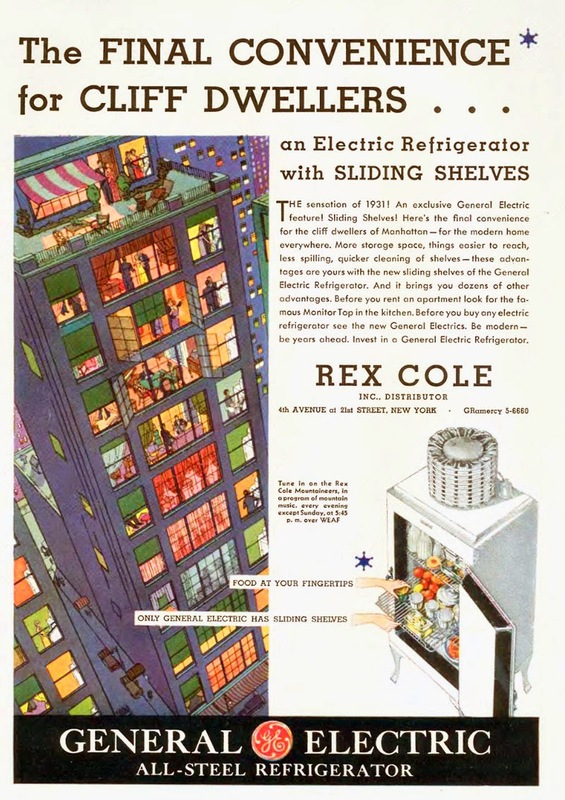 That's half the height of the apartment building depicted in this 1931 advertisement, whose 'cliff dwellers' would enjoy the then-modern convenience of sliding refrigerator shelves. As NYC is, shall we modestly say, a slightly competitive environment, let me counter that boast with another engineering factoid: The elevators in 1WTC are the fastest in the western hemisphere, traveling 23 miles per hour to reach the top floor in 60 seconds.